As a follow-up to my previous post on using Handbrake to rip DVDs, I wanted to do a short write-up on how to use a program called DeVeDe to restore those MKV, AVI, and MP4 files that you ripped earlier back to a DVD that you can use on any DVD player. Before finding DeVeDe, I had been looking for a good solution for DVD creation on Linux for awhile. However, nothing had really impressed me very much. They generally had clunky, bloated UIs and didn't support a wide range of file formats. DeVeDe changes all that; it uses the same mencoder backend that Handbrake does, allowing it to support a wide range of files (pretty much anything mencoder supports). It also sports a very simple but powerful UI, allowing you to make pretty much any customization you want to the menu and to have very complex DVD title structures. This is while also not being overly complex for entry level users, and pretty enough that it doesn't burn your retinas to look at it. Now that DeVeDe is installed, let's open it up and take a look. As you can see, you'll first be prompted for what kind of CD/DVD you want to make. For this tutorial, we will assume you're making a normal DVD, but there are a lot of other options you can follow if you wish. Now we are presented with the home screen, the place where all the magic happens. You are started out with the most simple DVD possible: a single DVD title, generically named, and a simple default menu. From here, you can do pretty much anything you want to do. In the interest of keeping this simple, we will assume that you just want to burn a backup of a single movie. First things first: let's name the title. To do this, simply click on Properties. Here, simply enter whatever you want the title to be named, and select the action you want taken after its finished (I would suggest just going to the menu afterwards). After you're done, click OK.
We now need to add a video file to the title. To do this, simply click the Add button under the Files box on the right. Click the file dialog button and select your video file. I would also suggest changing the format from PAL to NTSC if you are living in the U.S., most DVD players expect NTSC content here. If you know differently for yours though, or it can handle both, then don't worry about it. If you do need to change to NTSC and you're adding a lot of video files, you can make this the default on the home screen. From the add file dialog screen, you can also chose what audio track you want to use (if there are multiple), and you can add your own custom subtitle files simply by clicking the add button next to the subtitle box and selecting the sub file. There are also a number of very useful advanced settings that you can mess around with if you feel so inclined (default settings have worked for me though). Before you finish, I would advise clicking the Preview button as well. It will encode a sample of the video with your settings and play it back so that you can preview what the DVD will look like when finished, and to make sure everything is in sync (very handy feature!). Once you are satisfied with your settings, simply click OK.
Now, you need to configure your menu. For me, I really don't care what the menu looks like, so I just leave the default in. However, I'm sure there are many out there who don't share my thoughts, and would like to customize away. If so, simply click the Menu Options button at the bottom of the home screen. From here, you can make pretty much any change you want to. 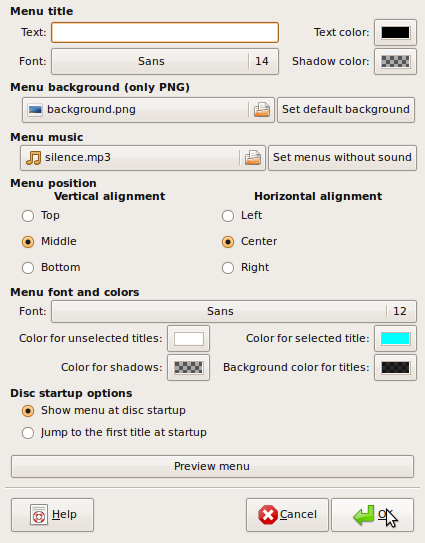 Add music, add a custom background, title the Menu, change the font, everything. I won't go through this in depth, but you can play around with it and see what happens! You can also preview the menu from here, so you can see what it looks like as you're making it. You're almost done now! The last thing you need to check is under the Advanced Options tab at the bottom. If you have a multicore CPU, I would advise selecting the Use Optimizations For Multicore CPUs option. This will greatly speed up your disc creation time. Once you've checked this, go ahead and click Forward. You will now be prompted with where to save the ISO image of the DVD. An ISO image, for those who don't know, is basically a bit for bit copy of a DVD, and we will use it to actually burn our DVD. Once done, just click OK and go get a cup of coffee. It will be a little while, as DeVeDe needs to encode your video into the proper format. After it finishes, get a DVD and insert it into your DVD burner. Open up the folder where you saved the ISO, double click the file (right click->Disk Burner on Jaunty), and click Burn. Wait for it to finish, and then you're done! Go plug it into any DVD player, and it should work like any other disc. And that's it! 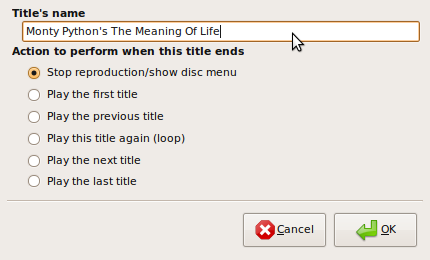 I hope this was helpful to some of you out there wondering how to create DVDs in Ubuntu, feel free to ask if you need help or clarification.